As a field that is gaining traction, content marketing has a number of fatal flaws and issues in its implementation in many organizations. Below, we list some of the most common mistakes that we have identified in this field. The primary mistake that most people in content marketing jobs do is focusing on immediate results with very little consideration for their overall goals. While it may be tempting to aim for quick results and feel the adrenaline rush that accompanies it, there is very little scope if this job is approached with a myopic view. It is essential to have a long term goal and establish certain milestones with a timeline. All marketing activities must align with these objectives for optimum results. When results seem underwhelming, keep in mind that good customer relationships are built upon a foundation of trust and bonding which is formed over longer periods. These are the relationships that will truly add value to the organization and should be the sole purpose, instead of individual customers for shorter periods. If a content marketer isn’t short-sighted, there is a very high chance that they will look so far ahead that they will forget about having a sufficient amount of success in the current stage. While it is a good idea to look into the future and follow methods to plan, there is a need to have a general level of success over some time so that the marketer does not lose attention. Moreover, there are some plans and strategies which may be very time sensitive. A few days of procrastination or indecisiveness can cause a lot of loss in terms of audience. Moreover, some opportunities once lost cannot be gained again. A number of content creators think that it is sufficient to churn out large chunks of material at regular intervals. Later, they complain because they do not seem to be gaining the traction they were expecting. It is important to remember that most good content requires a lot of hard work and patience. Quick content may often end up feeling perfunctory and may not deliver results. Always keep in mind that quality will outdo quantity. Consumers are attracted to good content and will only revisit particular sites if they are satisfied with the information they receive. Another common mistake is that creators tend to put out content that is not in lieu with that the consumers want. It becomes the responsibility of the creators and marketers to understand their target audience and the market before they decide to publish content. Any content which is not suitable for the target audience is simply a waste of time and efforts and will have a very limited reach. Most consumers are greatly attracted to only those entities which they feel are long-term and can be trusted. Hence, it becomes important for content marketers to make solid plans which are long term and can be executed regularly over a period of time. Any marketing which involves only individual bursts of attention followed by substantial media silence is not very effective. There is a high chance that the consumer who forget the content very fast if they are not reminded about it constantly. Similarly, it must always be assumed that the consumer has no knowledge about the content they are looking at or looking for. Simply changing the direction of the content without official notice or any prior intimation to the audience can be very confusing and detrimental to the overall image. It is a sure way to lose a large part of the target audience. One common mistake that is observed in most organizations is that they insist on allocating only limited funds for content marketing but expect incredible results. Like every other field, marketing requires certain resources that must be provided if there is any chance of success. Overlooking this function or treating it as the secondary is a sure-shot way to failure. It is important to have a dedicated team and a good budget so that the marketing activities can be consistent and effective. Often, marketing is an activity which is considered an add-on and the organization chooses not to employ specialists, which is another fatal mistake. 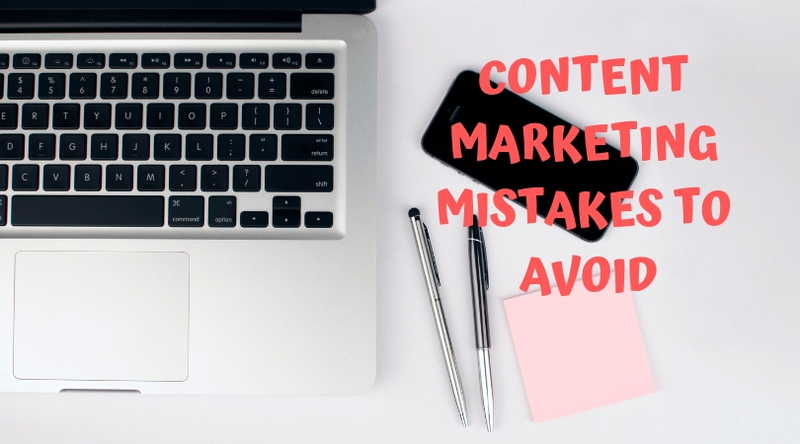 There we have the most common mistakes found with content marketing. We hope that this helps you improve your methods and correcting mistakes you may not have realized you are making.